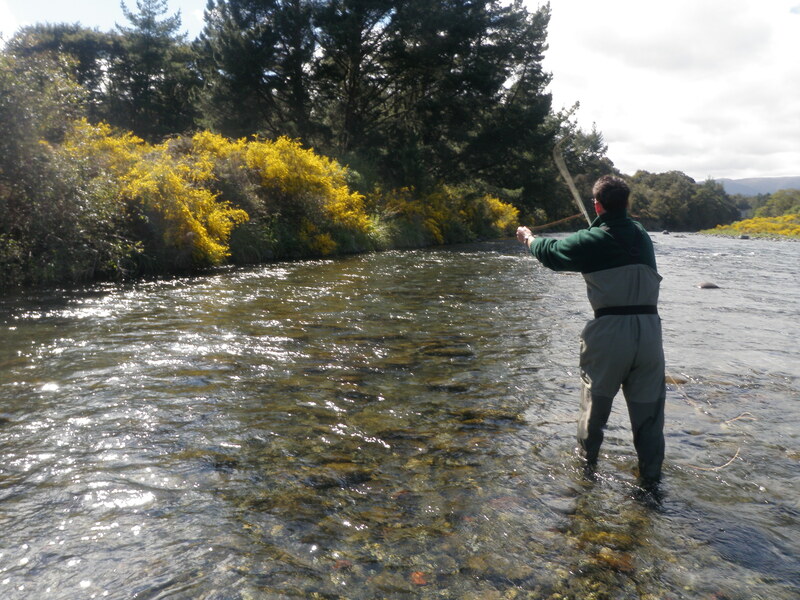 Just another short update on how I have found fishing in the Tongariro the last couple of days and where other anglers have found fish that I really haven’t! Â Last Thursday myself and Mario had a great day in the Stag and Duchess so while guiding one of my regular clients ,Peter from Palmerston North I thought this would be a great place to start . We were on the water at 7am on Saturday morning and conditions were perfect with no wind clear sky’s and enthusiasm high so I truly expected trout to still be sitting in the Stag. We fished up and down for two hours trying different nymphs, glo bugs, leader length and did not even get a touch which is typical of the Tongariro at the moment with one day being great the next being very hard. 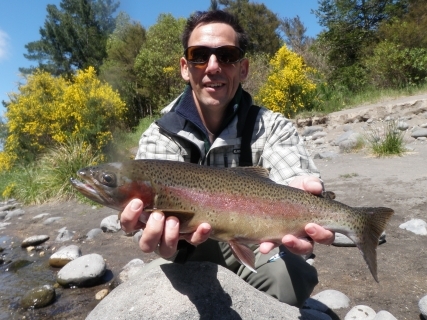 Spring is always one of those times of year that anglers seem to struggle slightly in the Tongariro and some of the best results are being achieved by just chancing it and trying your luck, there is no real pattern to follow. I dont want to harp on about the wind but it really is doing my head in at the moment as itÂ is destroying clients casting and making the day that much harder for them. Peter is quite a good caster but not quite experienced enough to adjust to strong winds and it really knocked his confidence and fishing around by ten o’clock. I have guided Peter 4 times in the last 18 months and we are now very close friends and both enjoy a very relaxed day on the river together but do like to get fish in the bag. We have caught trout on every occasion but on this half day trip I was certainly looking down the barrel of a skunking as we had been through 3-4 pools in the upper river and had seen nor touched anything. We dropped into the Upper Birch behind the trout centre and could see up to ten fish cruising in and out of the swirly deep water sitting on the sand, these are hard to catch and even harder to get a drift at. With nothing to loose I lengthend the leader doubled the weight and tied on a blood worm pattern as the trout sitting on sand seem to know what Â these are. Peter was not impressed with the long leader and double the weight with the wind blowing down the river but if he wanted any chance of getting down to these fish quickly he had no choice. We strapped his crash helmet on as he became casting and after about ten goes we got one which would should have been bouncing amongst some fish and should have been in with a chance. A Â messy short drift swirled about and the indicator was sucked under not knowing if it was just weight of the fly or a trout I told him to strike and sure enough line started peeling through his fingers finishing with a nice jump of an angry fish on the other side of the pool. Thankfully we landed the only trout hooked for the half day which was a stroppy thick backed jack and the skunking was of my shoulders once again. We ventured on up to the Silly pool and spotted alot of fishing sitting in here as well so when the fish decide to start opening their mouth again the middle reaches seem to have the majority of fish in it. Another good rain woud not go astray at the moment but I’m not sure if we will see it now. 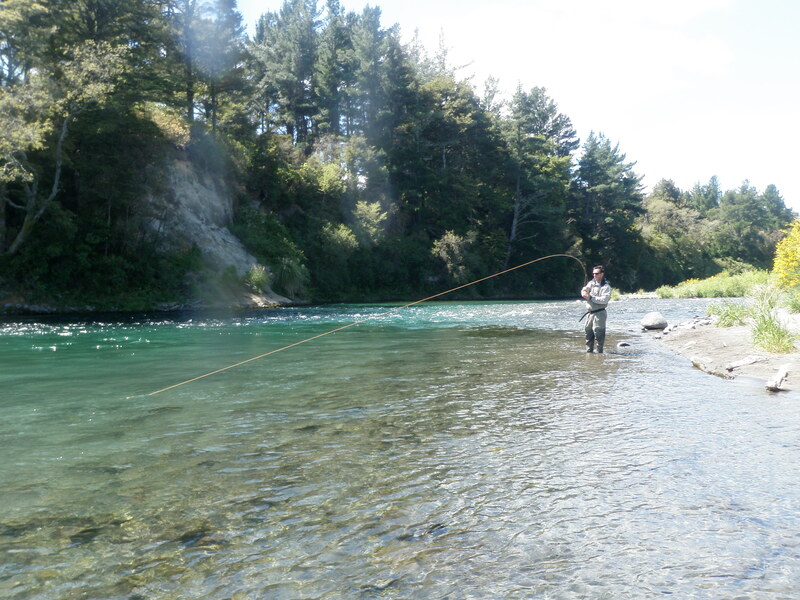 I am currently putting togetherÂ a special blog about one of the best days guiding I have ever had which took place on Friday with Bart and Larry from America while fishing the headwaters of the Whanganuie using the quad bikes. Be sure to click into this page in the next couple of days as this is worth the trip and a sure thing to do in the next few months as this fishery is on fire with large, angry , fat resident trout. Hope anglers enjoyed their fishing over the weekend and you have some plans to get out in the next couple of weeks and enjoy some backcountry adventures. Monday update: Sorry guys three days guiding has just come in last minute using quad bikes and heli fishing so wont be able to do the report for a few days. Had a 15 fish day in the Whanganuie today so backcountry fishing is on fire and looking forward to more of the same tommorow. Again very sorry but will update at first opportunity.